I’m not going to lie; I knew when I set out on this blog theme that there would be down weeks. I just never thought it would be week 4. With acupuncture and Chinese herbal remedies, my back, knee and shoulder pains have been rendered rather tolerable. My plantar fasciitis has been the hold out, but still a shadow of its previously irksome self. I’m not sure why my back and heel pains flared so violently last week, although I am worried that my back pain might actually be Sciatic Nerve Injury versus the previous basic lower back pain. 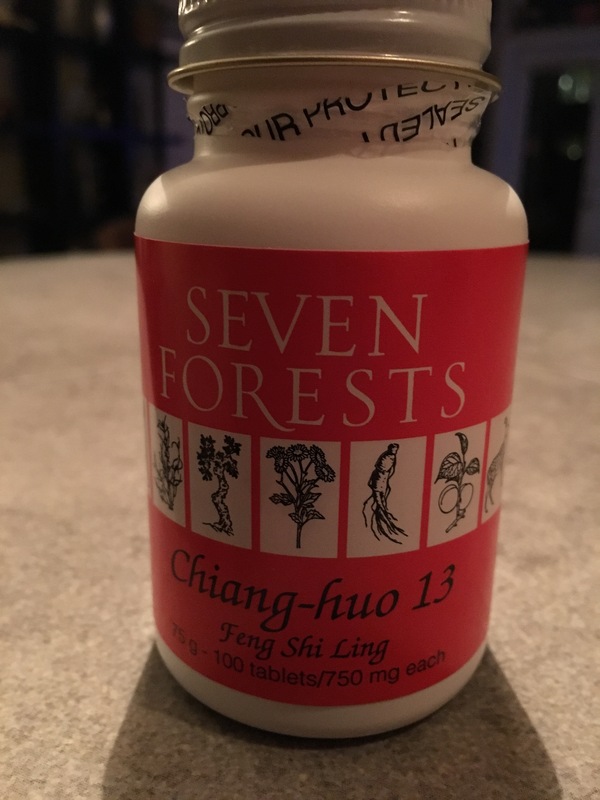 Regardless, increasing the dose of Chiang-huo 13 from two pills twice a day to three pills twice a day did wonders to calm things down to a dull roar. It was still better than the original dose of three pills, three times daily. It probably didn’t help matters that my acupuncture appointment was mis-scheduled, resulting in me missing a treatment. That said, I’m particularly eager for this coming Tuesday’s session! So, it shouldn’t surprise anyone that I didn’t make it to the gym this past week. I did get my walking in at work, though…30 miles. I’m not entirely alone in my fault. The Silver Fox is a wonderfully enabling influence. When I awoke on Friday after 11 hours of somnalistic bliss, I only managed to move from the bed to the couch…where I watched two movies back to back after The Fox begged off our traditional Friday morning coffee due to a headache he’d had for five days. When I shared my plans for remaining on the couch, he encouraged me, claiming that with as much as I work I deserved a break. He had his own acupuncture appointment that morning, the routine is usually coffee and then he heads off to acupuncture. Flash forward to the next day, when he returned to the OCOM pharmacy to pick up his headache concoction that had been made up special for him. No prepackaged stuff for his malady, his acupuncturist had a special ancient Chinese secret in mind for him. Four pills every 12 hours, three doses. The pills looked like rolled up potato bugs. The Fox gobbled the first dose down with, if I’m not mistaken, a hearty swig of wine. Hey, there’s no rule that says I can’t also enable him! Forty minutes later: headache gone. Anyway, here I am, on the brink of week five, facing a strange emotion: I miss being at the gym. Two full body lifting workouts. And an hour of yoga. That makes for a busy week, but I’ve got ground to make up! I mean, I didn’t exercise last week…but I still managed to have a drink or two or three each night of the week. A combination that does not a svelte 50 year old Xtopher make.